Full details of the arms used in the 13 November massacres will emerge in time. 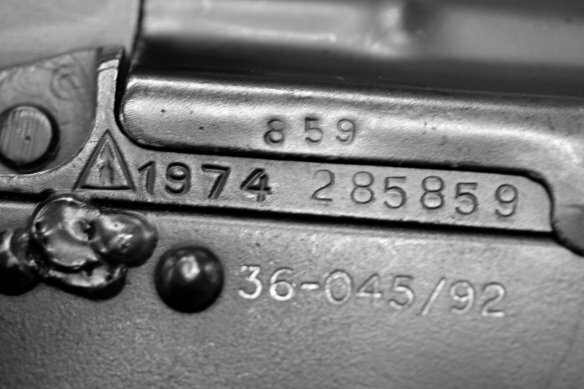 This post provides some information on illicit automatic weapons, such as the Kalashnikov, in France, and how they reach illicit markets. Overall, it appears that there is a pool of several thousand illicit military style firearms in France and relatively small numbers are trafficked in from abroad. Such quantities mean that terrorists and criminals in France and neighbouring countries can obtain Kalashnikovs and similar weapons, and that should be a matter of great concern. Nevertheless, Europe is very far from being ‘awash’ with illegal Kalashnikovs or similar automatic firearms. The relatively small numbers being trafficked and in illicit possession in Western Europe suggest that better coordinated police action – especially improved coordination, intelligence and analysis of illicit firearm markets – could meaningfully reduce illicit trafficking and possession. What guns were used on 13 November? It has been widely reported that the shootings in Paris on 13 November were carried out with Kalashnikovs, and three rifles, described as being 7.62mm calibre Kalashnikovs of differing origin, were found in a car said to be used by the attackers. Weapon identification can be difficult, especially by witnesses to an atrocity, so initial reports of the precise type of arms used are often updated. But given the number of people killed in such a short time in the restaurants and concert hall it is very likely that the attackers used military style firearms capable of fully automatic fire, such as an assault rifle like the Kalashnikov or a smaller sub-machinegun. Did firing the guns require military training? A novice may be surprised by recoil forces generated by automatic gunfire and find it difficult to aim the weapon. But an adult male (as the attackers have been described) with minimal experience of firing such a gun would not find it difficult to spray bullets into an area crowded with people. How common are illicit automatic firearms in France? The best indicator of the prevalence of illicit automatic weapons in France comes from police seizures of such weapons. The official annual compendium La criminalité en France contains a short section on illicit weapons. The section centrale armes, explosifs et matières sensibles (SCAEMS) has recorded the seizure of 5215 arms in the year 2013, 3905 in 2011, 2710 in 2010, and 1 508 in the year 2009. Of those about 3% to 6.5% of arms seizures have been of automatic weapons. Overall, total seizures of automatic weapons in France were 271 in the year 2013, 272 in the year 2012, 153 in the year 2011, 90 in 2010 and 67 in 2009. In 2012 89 of those seizures were identified as being Kalashnikovs. Media reports indicate that in 2014 5300 arms were seized, of which 175 were automatic firearms. The increase in seizures since following 2009 could both be a result of increased numbers of illicit arms in circulation, or of increased police vigilance. If the increase in seizures is suggestive of a growing problem of illicit arms in France, they haven’t resulted in an increase in homicide. In 2009 there were 682 homicides, the same number were recorded in 2013. Overall, the 2013 homicide count is almost half what it was in 2002, when there were 1119 murders. Furthermore, in Paris, there has also been a long term decline in both homicide and homicide committed with firearms, with 2013 having less than half the number of homicides by firearm in Paris compared to 1994. Media sources sometimes repeat estimates of 10-20 million illicit firearms in France. However, that figure refers to unregistered firearms, most of which were purchased lawfully before registration was required. A 2010 news article reports a French Ministry of Interior estimate of 30 000 illegal weapons circulating in deprived urban areas, with about 15% of the stock, or about 4000 weapons, being automatic firearms such as Kalashnikovs. That estimate of 4000 automatic weapons is still being used in 2015. The impression from seizures and the somewhat out of date estimate is that there are relatively small numbers of illicit automatic firearms available in France. In a country of some 66 million inhabitants the seizure of between 90 – 272 automatic firearms per year, and a rough total measured in thousands, suggests that illicit ownership of automatic weapons is rare. There is likely a pool of several thousand automatic firearms in criminal possession in France. But hitherto they have rarely been used to kill, and those homicides have declined over the past decade and a half. The availability of those weapons is clearly a matter of great concern, but even after the massacres on 13 November, France will have one of the world’s lowest annual homicide rates. Who is obtaining illicit automatic weapons in France? Arms trafficking is described by the French government as providing weapons to criminals involved in activities such as armed robbery or trafficking (including narcotics), to terrorists, and to collectors (who are unable to lawfully obtain such a weapon). Overall, demand for illicit automatic firearms appears to be limited to people already engaged in violent criminal activity; and with some also acquired by collectors. As is found in other similar countries it is likely that there is limited demand in France for an illicitly trafficked automatic weapon. Unlike other illicit commodities such as narcotics or counterfeit goods there isn’t a widespread consumer demand for trafficked firearms in countries, like France, that experience low levels of violence. Large scale trafficking is associated with civil warfare. What are the sources of illicit automatic firearms in France? There are two likely sources of arms used in the 13 November attacks. The wars in the former-Yugoslavia left large amounts of military firearms and other equipment out of state control. For example, a survey published in 2011 estimates that there are some 750 000 firearms illegally held in civilian possession in Bosnia and Herzegovina. Every year small quantities of firearms and ammunition leak out from these stocks in the Western Balkans and are trafficked into the rest of Europe. A second source is firearms that have been ‘de-activated’. Deactivation happens when a working firearm is modified so that it can’t be fired. They can then, in many European countries, be sold with far fewer restrictions than working guns, and they may be purchased for use as props in film or theatre productions, or owned by private collectors. There have been cases in the past where de-activated guns have been re-activated, or modified so that they can once again fire live ammunition. For example, it has been reported that French police investigating the Charlie Hebdo attacks examined whether de-activated arms had been purchased from a Slovak dealer, and the guns subsequently re-activated. There are or course other possible sources for Kalashnikovs – for example theft from armed forces in Europe; or trafficking from further afield. How would the weapons get to France? Trafficking in Europe usually takes place on a small scale. If the arms are being taken across Europe by a smuggler they would most likely transport a small number inside a private car or similar vehicle. Last week German police apprehended a Montenegrin headed for Paris, and they found in his car: eight Kalashnikovs, a revolver and two pistols, ammunition, two hand grenades and 200 grams of TNT explosives. It is unclear at this point whether he was connected with the Paris attacks. Whether or not, he is a good example of the form and level of arms trafficking – roughly speaking we are concerned with firearms concealed in a car rather than truckloads of guns. A second means of transporting weapons across borders is via mail or parcel delivery services. For example, a gun might be dismantled into its component parts and sent through the post (the contents listed as something like ‘bicycle parts’ to allay suspicion). In 2014 French police arrested 57 people for illegally purchasing illicit firearms, including Kalashnikovs, that were ordered over the internet and delivered by post. In 2012 French police seized 27 arms, including Kalashnikovs and Uzi sub-machineguns, that had been acquired by a collector via the postal service.